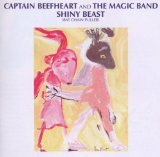 Shiny Beast (Bat Chain Puller) is ranked 5th best out of 28 albums by Captain Beefheart And His Magic Band on BestEverAlbums.com. The best album by Captain Beefheart And His Magic Band is Trout Mask Replica which is ranked number 187 in the list of all-time albums with a total rank score of 14,662. Members who like this album also like: The Clash by The Clash, Marquee Moon by Television and London Calling by The Clash. Related links: top tracks by Captain Beefheart And His Magic Bandtop tracks of the 1970s, top tracks of 1978. Better than TMR, better than Safe as Milk. I'm sober, and I'm serious. This is like all the best of Beefheart's eccentrities, but in what is a very accesible piece of work. Lovely guitar work on most of the tracks. Favourite tracks: Bat Chain Puller, Candle Mambo.. But you know what, most of the tracks are on similar level I think. Although I disagree with you, I understand how you arrived at that conclusion. I was initially torn between including either this or the brilliant 'Doc At The Radar Station' in my list. However, after much thought, I finally settled on the former. I find this to be one of Beefheart's most uncompromising and intriguing albums. In my view, it's one of the most musically diverse and spectacular works the Captain ever produced. The album bristles with vitality and imagination that transcends the kinds of kitsche elements associated with cocktail lounge and salsa - assentuated by the prominent sounds of the marimba and trombone - of the kind you refered to. The album maintains a revolutionary cutting edge that's never far from the surface. Following a relatively fallow creative period for the Captain, the master returned to form with this brilliantly uncompromising, acerbic and vibrant tour de force of an album, arguably his greatest record since 'Trout Mask Replica'. It was as though the post-punk aesthetic that Beefheart invented (which at the time the release of this album was now taking shape) had rejuvinated his creative juices once more. The sonic experience on this album is spectacularly visceral and it still sounds as revolutionary now as it did 35 years ago. A critical re-evaluation of this brilliant work is long overdue.